A charming and beautifully renovated, extra-wide semi-detached home in the heart of East York! This lovely home has had numerous renovations and improvements that offer a wonderful blend of modern features and traditional design. You will appreciate the quality of the renovations from the moment you step through the front door! The living room is a warm and inviting space that features exquisite woodwork including new oak hardwood floors, staircase, and original stain glass window. The large dining room is open to the living room and features a quartz clad decorative fireplace surrounded by two built-in bookshelves and large window with Hunter Douglas Blinds. The kitchen is a chef’s dream with custom cabinets, bamboo flooring, high-end stainless steel appliances, including a gas oven, and a walkout to the spacious and well landscaped backyard. The second level features 3 good sized bedrooms and a spa-like 3 piece bathroom with heated marble floors. The large Master Bedroom can accommodate a king sized bed and features a custom built-in closet. The second bedroom has a custom built-in desk with a quartz counter top that could be an amazing office, while the third bedroom has a built-in shelving system, perfect for an upstairs TV room. The basement runs the full length of the house, offering excellent storage space and features front loading, energy efficient, Kenmore washer and gas dryer. 2014: To stud reno main and upper floors (with permits). New solid hardwood oak floors; new fiberglass casement windows—except in bathroom & kitchen (manufacturer: Marvin); spray foam insulation; ductless A/C on upper floor; drywall (lathe & plaster removed except for common wall in dining room & stairway); new oak stairs, banisters, railings, and staircase façade installed; new fiberglass/steel front door; fireplace clad with quartz; cabinet/storage built-ins in two bedrooms & desk built-in in one bedroom (cabinet manufacturer: Cortina; desk top material: Quartz); pot lights. Replaced cast iron radiator piping with PEX. Customized Hunter Douglas blinds in living & dining rooms and 3 bedrooms. 2009 & 2010: Kitchen and bathroom to stud reno (electrical inspection completed). Bathroom has heated floor (electric) and heated towel rack (tied into radiator system and doubles as radiator for bathroom). Bathroom & shower base floor are marble. 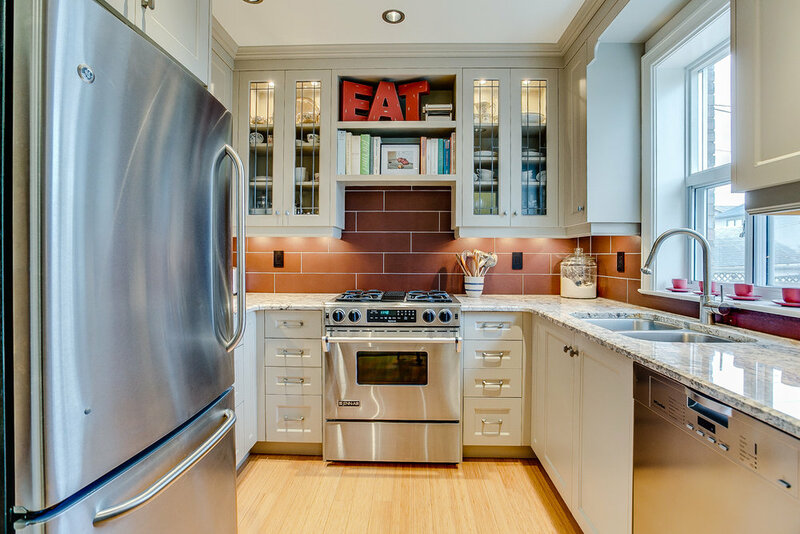 Custom kitchen cabinets (manufacturer: Olympic kitchens). Solid bamboo floor in kitchen. New backdoor & screen door installed.